A Design and Architecture School called Bauhaus was established in 1919. Its name is still regarded as a mark of quality of design. It developed into an international arts / design movement and its influence on design has been considerable. 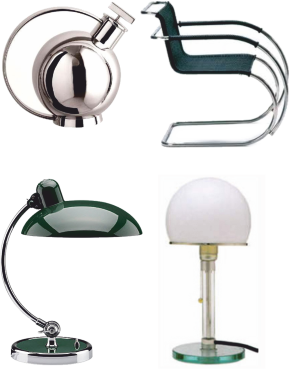 The Bauhaus encouraged designers, to design and develop products that were stylish and aesthetically interesting and mass produced. The Bauhaus has influenced architecture, furniture design, interior and exterior design. There is even a Bauhaus font / writing style. Bauhaus approached product design in a fresh way. They moved away from traditional skills and fashion to new ideas and ways of manufacturing on an industrial scale. 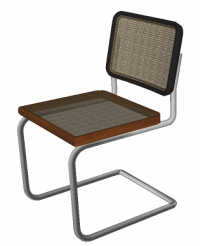 Marcel Breuer designed this famous chair and manufactured it from one piece of tubular steel tube. It typifies the Bauhaus philosophy - simple design, mass produced, modern, aesthetically pleasing and for the general public.